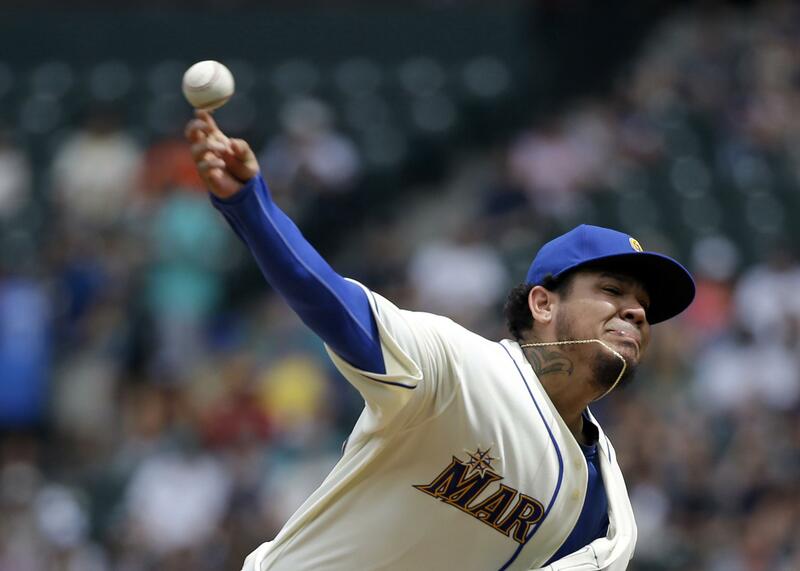 Sat., Sept. 2, 2017, 7:29 p.m.
SEATTLE – Could James Paxton, Felix Hernandez and even Hisashi Iwakuma return to help the Mariners in the final weeks of the season? How about all three? The possibility of getting back at least one or two has taken a step forward in the past few days at Safeco Field. A day after Hernandez (shoulder bursitis) stepped on a mound for the first time since going on the disabled list, both Paxton (pectoral strain) and Iwakuma (shoulder inflammation) threw bullpen sessions Saturday as part of their throwing programs to get them back into the rotation. Hernandez confirmed that he will throw another bullpen session Monday, followed by a simulated game Friday. Paxton threw 27 pitches in his first time back on the mound since going on the disabled list Aug. 11. Throwing without pain is the key. Paxton didn’t throw any breaking pitches in the session. He will throw another bullpen session Tuesday and a simulated game Saturday. Iwakuma threw a 40-pitch bullpen, and the reports were positive. Because the minor-league season ends Monday, the simulated games will serve as rehab assignments. There is a chance that Paxton and Hernandez could get back into the rotation on a limited pitch count if they perform well. The Mariners hope it happens for at least one of the three pitchers. Another day, another roster move for the Mariners and general manager Jerry Dipoto. On Saturday morning, the team selected the minor-league contract of veteran middle infielder Gordon Beckham and added him to the 40-man roster. To make room, utility infielder Shawn O’Malley was designated for assignment. Beckham, 30, hit .262 with 16 doubles, nine homers and 45 RBI in 83 games with the Triple-A Tacoma Rainiers. Beckham has plenty of big-league experience, playing in parts of eight seasons and over 900 games. He’s a career .240 hitter at the big-league level. “I don’t know how much he will play, but he allows you to maneuver the rest of the guys without the fear of running out of shortstops,” Servais said. O’Malley, 29, has been riddled with injuries this season. He underwent an appendectomy just before the season began and then had shoulder surgery. He recently suffered a concussion in a game with the Rainiers and was placed on the seven-day disabled list. Because of the injuries this season, he’s likely to clear waivers and be outrighted to Tacoma. Published: Sept. 2, 2017, 7:29 p.m.